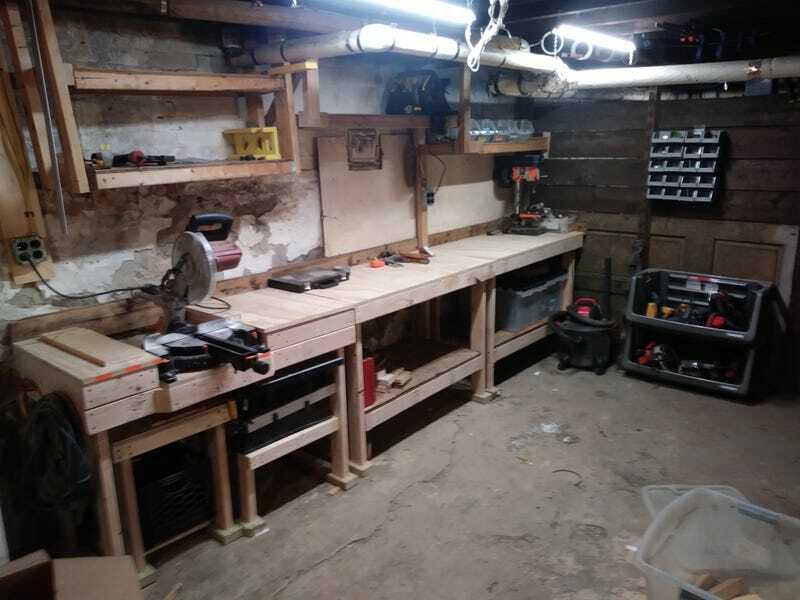 The bench project in the basement is done, aside from minor details and getting all the tools/supplies sorted and onto it. I’ve also installed two double plug boxes on the wall and added overhead led lights. First is the saw bench, made so the miter saw deck is even with the benchtop. The table saw and its stand fit underneath. The shelf supports above ended up looking wonky (the shelves are level) as one of the 120+ year old house joists has a twist in it. Middle bench has a higher shelf to clear the fireplace cleanout, and has the drill battery charger mounted to the front of the shelf, which I’ve already discovered is amazing as i can see if the battery is charged from across the room. Bench three has boxed nails/screws/staples on the shelf above. And bins for plumbing and electrical supplies below. The end wall has bins for power tools below, and small bins for loose hardware above. Hanging from the post are bolt/nut size checkers. They were about $55 on Amazon and have already proved their worth. I am going to need more hardware bins soon. I’m really happy with how this all went together, and am looking forward to this space meaning i spend less time looking for stuff and more time getting things done.